Did you know that most traditional disposable diapers are made with materials that have been bleached with chlorine? You might be surprised to know that the use of chlorine can release harmful toxins into our environment and later accumulate in both people and animals. Once such chemical is dioxin, exposure to which has been linked directly to cancer, birth defects and reproductive disorders according to several studies. Here's another surprising fact: many national brand diapers continue to use a super-absorbent gel call sodium polyacrylate, a synthetic gel that was banned from use in tampons 25 years ago due to its link to Toxic Shock Syndrome. Thankfully, we now have a much safer alternative. Earth's Best is a brand that has been a part of our regular shopping list for the past 5 years. From organic baby food to cereals, cookies and waffles, we have stuck with Earth Best because our kids like their foods. 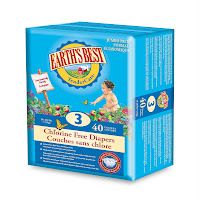 Now, Earth's Best has come out with their TenderCare line of disposable diapers and really, what isn't there to like? They are latex-free, dye-free, perfume-free and toxin-free. In fact, the wood pulp from which they are made is certified chlorine-free and is made from renewable, sustainable forests. They also use other natural plant-based materials such as wheat and corn which helps to make Earth's Best diapers environmentally friendly by reducing the use of petro chemicals. For this review, I was sent a package of Earth's Best TenderCare diapers. Instantly, I remarked on how white they were. It was also nice to see that they didn't plaster images of popular cartoon characters on the outside of the diaper, just a little strip with the brand's logo on the front. I'm not sure if different sized diapers have strips with different images on the front but if not, I would imagine it would a be little difficult to differentiate between the sizes since I could not find a size label on the samples we were sent. But does that really matter much? What matters is that my son was comfortable and that Earth's Best TenderCare diapers were just as absorbent as other popular brands that we have tried. In short, I will definitely be recommending this brand to my friends with babes. It comes as no surprise that they came out on top in an eco-friendly diaper test run by parenting.com. And who knows, I may ('may' being the operative word) decide to have a third child in the very, very distant future. It's more of an improbability than a possibility, but in the slightest chance I do, I know Earth's Best TenderCare will make its way onto our shopping list. On another note, Earth's Best is currently running a contest where you can win free diapers for a year. Visit changeyourdiaper.ca and fill out a form to be eligible. And while you're there, you can also download a coupon that will save you $3.50 off your next purchase of Earth's Best TenderCare diapers. So what are you waiting for? Go ahead and change your diaper. Disclosure: I was sent a pack of Earth's Best TenderCare diapers along with a coupon for the purpose of this review. I was not compensated in any other way. The thoughts expressed in this review are strictly my own honest opinions.